Last week someone burglarized our car. Fortunately the burglar didn’t get much, if anything, and a window wasn’t smashed. (Someone left the door unlocked, apparently). But it was a reminder that, even though our Brookland neighborhood is quiet and safe, we’re still vulnerable to property crimes. Then this morning I noticed that a neighbor’s driver-side window had been smashed in a burglary. 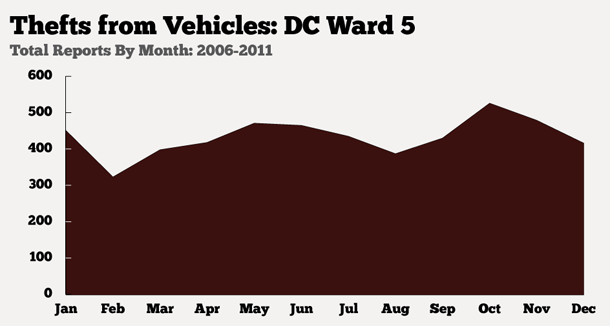 Looking at the data, it doesn’t appear that car burglaries are on the rise in our larger neighborhood, Ward 5. 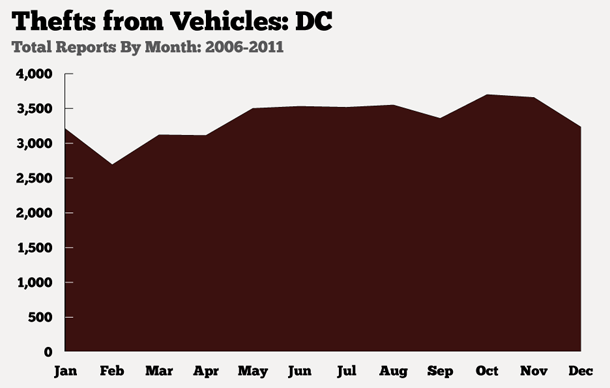 Residents here reported 109 car burglaries in January, for example, but only 59 in April. There also doesn’t appear to be a week-to-week uptick in April. I wondered whether the time of year makes car burglaries more likely, so I downloaded six years of major crime data (170,000 incidents of murder, robbery, theft, car theft, arson, sexual abuse, and vehicle burglary) to find out. Obama’s numbers peaked at 53 percent in the last week of May , but then dipped below 50 percent in June . His approval ratings sank to a low of 38 percent in October 2011, before returning to 50 percent in mid-April 2011. Click on the image to interact with the charts. Using Gallup’s weekly trends data — which can be sliced into groups based on religion, gender and party identification, among other categories — I created numerous interactive charts to show the trends since his presidency began in January 2009. The charts reveal some interesting, though perhaps not unexpected, trends. First, of course, there’s a clear partisan divide: 83 percent of Democrats approve of the president’s performance while just 13 percent of Republicans approve, according to the most recent weekly trends data provided by Gallup (through April 29). But other differences are evident. Only 40 percent of people who told Gallup that they attend church weekly approve. Compare that with 54 percent approval among people who rarely go to church. Older and wealthier people also approve at lower rates. I’ve broken the numbers out into 21 different area charts. Explore them here. A warning: The page is a bit sluggish in Internet Explorer. I haven’t had time to fix that. So, click here to get a proper browser. UPDATE: I added fresh data on May 27, so the graphics are current. Check them out.